My talk at the celebration of the life and times of the Totnes Pound. “Dearly Beloved. We are gathered here this evening not to mourn the passing of the Totnes Pound, but to celebrate its life and times and all that it meant to us, to this town, and to people around the world. The Totnes Pound was, in my life certainly, something bright and bold and brilliant and brave, something unusual and precious in our risk-averse times. It is only with hindsight that I can see what a brave thing it was to do, to just print our own money. We printed 300, with one side being a facsimile of the 1810 note, and the other side setting out the 18 shops who had agreed to take them. We were unsure of their legal status, and whether some Spanish Inquisition-style obscure department from the Bank of England would arrive and drag us off to a dedicated cell in the Tower of London. To get round this we wrote on those first notes, “this is a private currency which you may, by mutual consent, wish to treat as being roughly equivalent to a pound”, something later experience has shown to be entirely unnecessary, but it helped us to sleep at night. Promoting the Totnes Pound with Paul Hall from Colourworks. One of the most memorable moments around the time of their launch was when our then-MP, Anthony Steen (below), gamely printed some off in his Westminster office and was photographed holding handfuls of them to help with our promotion, a photo that rather came back to haunt him shortly afterwards when he was implicated in the expenses scandal and some bright spark printed that photo out onto posters that were then pasted overnight up and down the High Street! The Totnes Pound even made it onto The Archers! There was a delightful conversation between Cathy Perks and Pat Archer, in which Pat told Cathy that she is planning to start a Transition group and what it’s all about. In one part of their conversation, Pat said, in a list of what Transition groups do said “the Totnes Pound”, to which Cathy replied “The what?”. Pat continued, “Totnes, you know, in Devon. They’ve created their own currency which you can only use locally”. “Good grief”, Cathy replied, “that sounds very ambitious”. “Well”, said Pat, “it’s got to be”. That note was followed by the first £1 note proper, designed by Ben Brangwyn, with its heat detecting ink and its view of Totnes Castle. Once again they were printed by Paul at the now-defunct Colourworks, who printed 10,000 notes. The Herald Express in July 2008 wrote about the conundrum that was created when the Totnes Pound group paid their bill for the printing, £900, in those very Totnes Pound notes! The article continues, “so far Paul and Jo Hall have been feeding their 15 staff daily on bacon sandwiches and coffees which come from a nearby snack bar which does take Totnes Pounds. “We weren’t expecting to be paid in Totnes Pounds”, they said. “It came as a bit of a surprise but we have risen to the challenge””. Great stories started to emerge. One of my favourites was the woman who was vox-popped in Totnes and asked “do you know what the Totnes Pound is?” and replied “I imagine it is where they take all the stray dogs”. I met the Prince of Wales and gave him a Totnes Pound, inviting him to come here and spend it, something which, to the best of my knowledge, he has yet to do. He’s got just a couple of months left to do so! The Pound featured on The One Show on the BBC, and local girl presenter Lucy Siegle then passed notes around to all the members of boyband Westlife who then had a conversation about whether they could be spent in Dublin or not, one of the most surreal moments of the whole project. Michael Portillo came to town, for his ‘Great British Railway Journeys’ programme, which featured me talking to him about the Totnes Pound, something he clearly thought was utterly insane and backward looking. It was clear that he felt it was something that would be deeply injurious to the very notion of progress if it took off elsewhere but he humoured us as local eccentrics. I loved the bit in the show where he went to Totnes Bookshop to buy a book with his Totnes Pounds, and asked “Can I have one Totnes penny in my change please?” only to be rather patiently told, “unfortunately we don’t have those yet I’m afraid”. There was the time when we received an email that read “I am treasurer of a church in Cumbria and we have received a Totnes Pound in our collection box. Is it worth anything or do we just throw it away?” As I remember, we suggested a trip to visit the fine churches of Totnes. A second, more attractive £1 note was issued. The Telegraph wrote an article about the Pound which suggested that, in fact, they had never actually left London before writing it. Can you guess what gives it away? “The Totnes currency has been going since 2006”, they wrote. “You can spend it in the butchers, curry house or fish shop, but you can’t spend it in the local Tesco”. (The answer: Totnes doesn’t have a Tesco). It was fascinating to see the other brave folks around the country who then started up schemes inspired by ours that took the idea further, all of which have been recently gathered together in Guy Singer’s amazing book ‘British Transition Town Money’, a kind of catalogue of local currency for geeks who find such things of interest (i.e. me and him). It beautifully captures the colourful, playful, imaginative explosion that ensued. There was the Lewes Pound, whose first £1 notes sold out in 2 days and which were, until they did a reprint, selling on Ebay for as much as £50. They were the first people to produce a £21 note, something we’ll return to. There was the Stroud Pound. The Brixton Pound with its iconic David Bowie £10 note. The Bristol Pound was the biggest currency launch to date, one that prompted the Bank of England, after much deliberation, to publish legal advice saying that so long as local currencies didn’t feature the Queen or pretend to be sterling, they were OK. The Totnes £21 note appears in the French film ‘Demain’. And that’s just the UK. Following the appearance of our £21 note in the French film ‘Demain’ (‘Tomorrow’), everywhere I go in France now has a local currency inspired by the Totnes Pound. It’s quite a legacy. I was just in Belgium for a few days, and went to a meeting of local currencies in the Wallonia region. Map showing the local currencies of the Wallonie region. Our £21 note, and it’s “why not?” response when people ask why, has inspired a whole wave of creativity and playfulness. One currency, the Yarg, launches soon in 1, 3, 10 and 30 denominations. La Zinne, a new currency for Brussels, launched 2 weeks ago with, among others, a 2.5 note and a 0 note, something it shares with Liege. When I asked them why they have a 0 note, they told me “well sometimes someone does something nice for you and you want to honour that but not put a value on it”. One group is launching a 13 note, and everyone seems to be taking the traditional 1, 5, 10, 20, 50 notes as a very loose starter, rather than the standard. The Totnes Pound also appeared in the CGSE Geography syllabus, meaning many young people have grown up with Transition and the Totnes Pound as part of their education, something that gives me a lot of satisfaction. The Totnes Pound also inspired people to take our basic idea and give it their own twist. We often received emails asking what we thought of some new model for a local currency that they had invented. For example, while I can see some merit to the idea, I still can’t get my head around the idea of a local currency backed by food. But surely the most bizarre was the person who wrote to share their idea of a local currency which consisted of signed and numbered pencil shavings. Pencil shavings. Thankfully the idea never took off. I am haunted by a mental picture of Bitcoin-style ‘mining’ consisting of sheds full of people sat all day sharpening pencils. 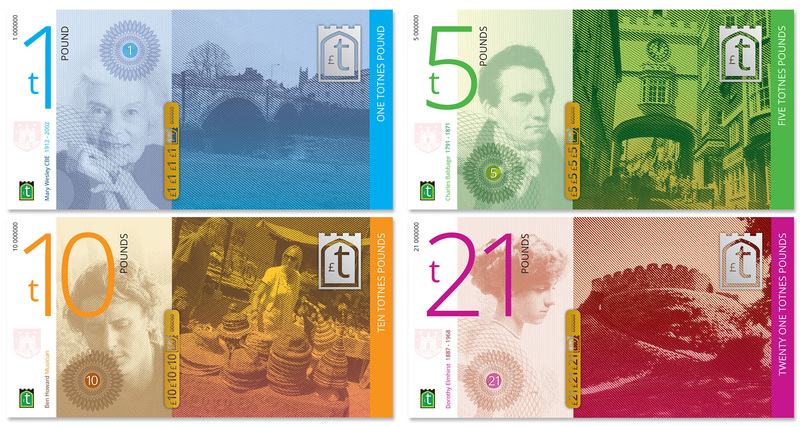 Then, in 2014 we issued our full suite of notes, designed by Rick Lawrence, which included our iconic £21 note, an idea shamelessly nicked from Lewes. The £10 note featured Ben Howard, who I spotted in a café at the height of our discussions about who should be on the notes, and shamelessly approached to ask if he’d be happy to be on one. Six months later he came to the launch, and spoke about how very odd indeed it was to appear on your town’s currency, but how honoured he felt by it. Those notes led to a resurgence of interest in the whole idea, and in circulation, far more realistic than doing all of your family’s shopping just with £1 notes! Ben Howard with the team at the launch of the full suite of Totnes Pounds. I have to share my own sense of just how it was going shopping with local currency in my own town. A study in Bristol showed that shopping with local currency notes leads to far more conversations than shopping with plastic, one of the most powerful spin-offs of such schemes as we live through what sociologists call ‘The Epidemic of Loneliness’. It was my experience here too. Getting Totnes Pounds out would lead to fascinating discussions and new connections. I loved the experience, and of seeing tills opening to reveal a bulging Totnes Pound section. It was a magical experience for me, and I think for many visitors, the idea that you could spend a currency other than sterling, and that traders welcomed them, was magical. I remember in 2015 going to an evening meal in London with a group of bankers. Not something I do often, or indeed since, but as you do, at a table full of bankers, I took from my wallet a bunch of Totnes Pounds and put them on the table. There was incomprehension. Then, as they were picked up and examined and passed around, a fascinating conversation ensued, along the lines of “well they are very cool, but why on earth would you want to do such a thing?” “Don’t they just make life very complicated?” asked one. “Do you use airmiles?” I asked him. “Of course”. “Do you use luncheon vouchers?” “Of course”. “Well you already use two complementary currencies. Do they make your life complicated?” “Anyway”, I added, emboldened by a couple of glasses of wine, “if they do make life more complicated for you, that’s kind of the point”. As we sit here this evening, on the evening we draw our beautiful scheme to a close, there is a question we need to address. Was the Totnes Pound a success or a failure? I think it depends how you look at it. If the aim was to create a currency that everyone would use, that would become the currency of choice for Totnes, that would enable a huge shift towards economic localisation, then yes, it failed. But does change work like that? I love the story of Thomas Edison, who famously made 10,000 prototype electric light bulbs before he created one that worked and was commercially viable. “I have not failed 10,000 times”, he reportedly said. “I have not failed once. I have succeeded in proving that those 10,000 ways will not work. When I have eliminated the ways that will not work, I will find the way that will work”. Progress, and creative approaches to change, are an iterative process. If we look at the Totnes Pound as being a community arts project, a ‘what if’ question that was rolled out into the town to spark the imagination, to invite reflection on what’s possible, and the telling of new stories about how the future could be, then I would say it has been a huge success. If the aim was to put the town on the map, it certainly did that. If many people in the world know one thing about Totnes, it’s that it has had its own currency. In ‘Demain’, when I was asked why we had a £21 note, I replied “why not?” I think that sometimes we underestimate the impact that that simple piece of paper from our small, delightful and slightly eccentric town. Indeed, one might argue that that one piece of paper embodies the spirit of what makes this place so special. It has been our international calling card. But we were working against the tide. We introduced a new form of cash at a time that history will look back on as the twilight of cash. The amount of cash in circulation is falling, some businesses rarely seeing any. This is a huge shift, and our attempts at a Bristol-style mobile-phone based currency didn’t generate the critical mass of support needed. Circulation fell, and so we decided to bow out gracefully. I must take this moment to thank a few people whose energy and enthusiasm have, over the years, been vital to the scheme’s achievements. Marjana Kos. Nigel Topping. Noel Longhurst. Ben Brangwyn. Sally Croft. Frances Northrop. Chantelle Norton. Nathaniel Holmes. William Lana. Mark Burton. And in particular, John Elford, who has been amazing. Your efforts, your dedication to something you loved, already appears in the history books. The anarchist anthropologist David Graeber once wrote “it is one thing to say ‘Another World is Possible’. It’s another thing to experience it, however momentarily”. That’s why the Totnes Pound was so powerful for me. It helped so many people to create memories of the future, lived moments of what a different, more hopeful, more delicious, more resilient future might actually be like. A future where people actually talk to each other and value those conversations. A future where it matters where your food has come from and what your relationship is with the person who grew it. A future where a key indicator of the wellbeing of your local economy is the degree to which money circulates and stays within that economy. A future where cash still has a role to play, enabling an economy that is reciprocal, informal and not constantly monitored. A future where our money is so beautiful, and so specific to the places we live, that future generations will hang them on the wall in the same way that the note that inspired this whole thing was. I hope that everyone in this room, and in this town, feels deeply proud of what the Totnes Pound was. Like Thomas Edison, its energy and bravery will live on in many projects that will follow. As I said at the beginning, we are gathered here to celebrate the life and times of the Totnes Pound, not to mourn it. But mourning is ok too. [I then invited people to share their stories of what the Pound meant to them, and then we had an auction of different notes, including this set of four that I had doodled on on my way home from Vienna on the train recently). If Transition is a Trojan Horse for Permaculture, as some have suggested, then the Totnes Pound was a Trojan Horse for Transition. It probably publicized the idea of Transition more than any other effort. Can we think of another effort like this to keep the future-needed-knowledge flowing? Hi Tony. Great way of thinking about it. Yes, you’re probably right. We’re working on that one….